Is it raining where you are? We are having some rare cool, wet weather here in Phoenix and it is turning my thoughts toward cardigans and school. This is actually the most fall-ish feeling weather we have had all year here in the Valley of the Sun. A recent week of below-freezing temperatures has killed most leaves here in Phoenix and they are falling off trees and bushes by the thousands and blowing around... just like autumn in non-desert climates (almost). Add to that gray skies and a little rain and it is really appropriate weather for bundling up in the morning as you grab your backpack and head out the door. This lovely little cardigan from the German company Kanz is on sale right now at MyHabit for kiddos 2-10 years old. It is normally $63, but is marked down to $29. I am tempted to make a Valentine's Day gift out of this one; it is about as innocent and cute as a cardigan could ever hope to be. 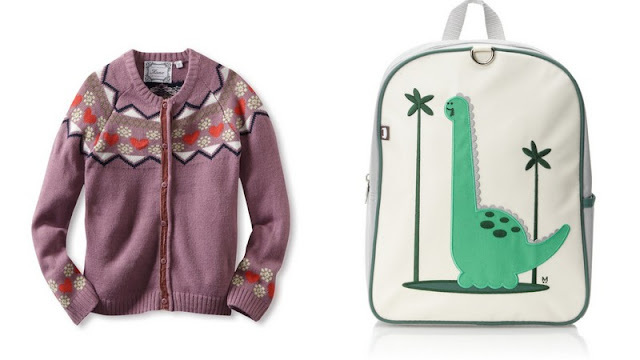 And this toddler dinosaur backpack from Beatrix is also on sale at MyHabit; marked down from $42 to $27 right now. Beatrix has been the preschool backpack at our house for all of my kids and I love them. They are the perfect size for little shoulders, have a wipeable vinyl bottom to keep them clean and a little pocket on the side that is sized for a water bottle. Everything on MyHabit ships for free, too. Wishing one and all a great school week! my kid love to see this bag. can you please tell me from where i get this bag? ?